Drum Corps International and the drum corps community are saddened by the loss of longtime corps director, contest volunteer and fan Bob Lendman this past Saturday after complications from a motorcycle accident. Lendman was perhaps best known as director of Phantom Regiment from 1976 through 1981, helping lift the corps up through the ranks to become a perennial contender for the DCI World Championship title. In 1982, he became director of the Blue Stars and assisted the corps through a time of rebuilding. Lendman then moved to Bloomington, Ind. and became an indispensable logistical asset to Star of Indiana founder Bill Cook prior to the corps' creation. He never strayed far from the corps and often drove the equipment truck during the nine years of Star's existence. For the past several years, Lendman worked behind the scenes at the DCI World Championships as a member of Drum Corps International's event staff. He was often seen in a golf cart, constantly heading in different directions to help keep logistics running smoothly and to take care of any problems that may have suddenly come to light. "It was always a pleasure to see Bob with Star and then as a DCI contest crew member," said longtime World Championship broadcast host Steve Rondinaro. In his formative years as a corps director, Rondinaro often turned to Lendman for advice when managing the Squires of Watkins Glenn, N.Y. and later when founding the Florida Wave. "He was always good for a laugh, and a true drum corps guy, through and through. I'll miss seeing him at the next big show." Lendman's wife Allison ran the DCI Mid-America Championship in Bloomington for several years and turned the event into a major community festival. The last year the show was held, in 1993, it attracted some 14,000 fans to Indiana University's Memorial Stadium. 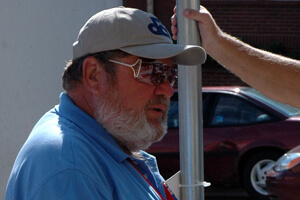 "Bob was a super volunteer for Drum Corps International for many years and a friend to many a corps with a broken vehicle that passed through the Bloomington area over the past 25 years," said DCI Executive Director Dan Acheson. "May he be remembered for all the good things he brought forth during his lifetime of service to the drum corps activity he loved so dearly." A memorial service for Lendman will be held in his hometown of The Villages, Fla., with plans for a second memorial to be held in Bloomington, Ind. the week of the DCI World Championships this coming August. Information on both services will be announced at a later date.